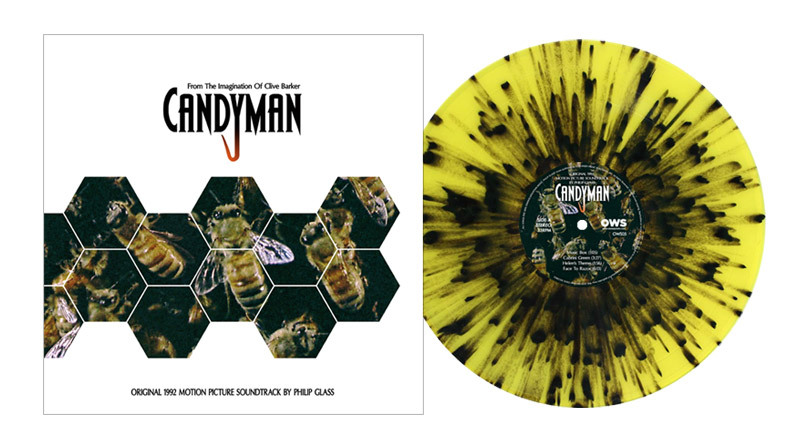 We’re very excited to announce a Wargod exclusive vinyl variant for One Way Static Records CANDYMAN Original Motion Picture Soundtrack – composed by Philip Glass. Pre-order now on ‘honey bee splatter’ vinyl, limited to only 200 copies. Philip Glass also needs no introduction. In the past 30 years he has composed more than twenty operas, eight symphonies and a multitude of concertos. Considered one of the most influential composers of the last century, Mr. Glass has had renowned collaborations with artists ranging from Allen Ginsberg, Woody Allen, Ravi Shankar, Paul Simon, Linda Ronstadt to David Bowie. Today we present to you some of Glass’ best work, the eerie minimalistic soundtrack to Clive Barker’s CANDYMAN. Now available for pre-order on ‘honey bee splatter’ vinyl (exclusive to Wargod), limited to 200 copies. Insert contains exclusive and extensive liner notes by author Clive Barker, composer Philip Glass, director Bernard Rose and actors Tony Todd, Ted Raimi, and Xander Berkeley. Pre-order is scheduled to ship before Halloween.